Happy Australia Day everyone. I hope you all had a great day yesterday and are enjoying a nice long weekend. Welcome to another CASEing the Catty Blog Hop. This week our inspiration is to CASE from the Floral Romance section of the 2019 Occasions Catalogue Pages 10-13. You may have arrived here from Tina’s gorgeous creation, thanks for continuing on with me. Make sure you visit all the Design Team’s Blogs by clicking on the “next” button at the bottom of each post. My inspiration for this weeks CASE comes from the “Happy Memories” card on page 12. At this time of year all the wonderful products in the Annual Catalogue seem to be forgotten about as we concentrate on all the lovely new products. So I’ve used products from the Animal Expedition Suite for this weeks CASE. My card doesn’t look much like the sample at all. I’ve used a DSP background and Wood Textures Frame like the sample and I have a picture inside my frame and some ribbon like the sample. I’ve changed the orientation of the card too, from portrait to landscape. These sweet little giraffe’s and frog have been die cut straight from the Animal Expedition DSP. You’ve got to love it when the dies match the DSP. I’ve added a few vellum leaves for the smaller giraffe to eat. There’s some 1/8″ Fresh Fig Ribbon and a border from the Delightfully Detailed Laser-Cut Specialty Paper behind the sentiment. The sentiment is from the new stamp set, Well Said. Welcome to another CASEing the Catty Blog Hop. This week our inspiration is to CASE from the All My Love section of the 2019 Occasions Catalogue Pages 4-9. You may have arrived here from Elizabeth’s gorgeous creation, thanks for continuing on with me. Make sure you visit all the Design Team’s Blogs by clicking on the “next” button at the bottom of each post. I couldn’t go past the “You Are Loved” card from our graphic above. Here’s a closer look. I love this card so much I haven’t changed much at all from the original version. I’ve used a card base of Thick Whisper White card stock and layered that with two more pieces of Whisper White. 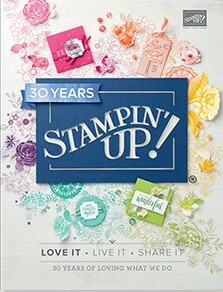 The bottom layer has been stamped in Lovely Lipstick and Granny Apple Green using the Forever Lovely stamp set. I used my Stamparatus to help line up the stamping to the die cut. The top layer of card stock has been die cut with the Lovely Flowers Edgelits Dies and it fits over my stamped flowers perfectly. I’ve adhered some small die cut flowers in Soft Sea Foam and attached a Metallic Gold Pearl to their centre. 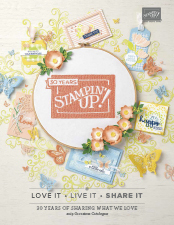 The sentiment is from the Happy Birthday Gorgeous stamp set and is heat embossed with Gold Embossing Powder. I’ve also added some Lovely Lipstick 1/8″ Grosgrain Ribbon behind the sentiment. Next up tonight is Tina’s beautiful project. Just click on the “Next” button to hop right over. My assistant, Marvi, celebrated his 6th Birthday on Wednesday. He still loves to sleep in the little basket he had as a kitten.